Rev. David Buck sits next to the Jesus the Homeless statue that was installed in front of his church, St. Alban's Episcopal, in Davidscon, N.C. The statue depicts Jesus as a vagrant sleeping on a park bench. St. Alban's Episcopal Church installed the homeless Jesus statue on its property in the middle of an upscale neighborhood filled with well-kept townhomes. The reaction was immediate. Some loved it; some didn't. The sculpture is intended as a visual translation of the passage in the Book of Matthew, in which Jesus tells his disciples, "as you did it to one of the least of my brothers, you did it to me." Moreover, Buck says, it's a good Bible lesson for those used to seeing Jesus depicted in traditional religious art as the Christ of glory, enthroned in finery. 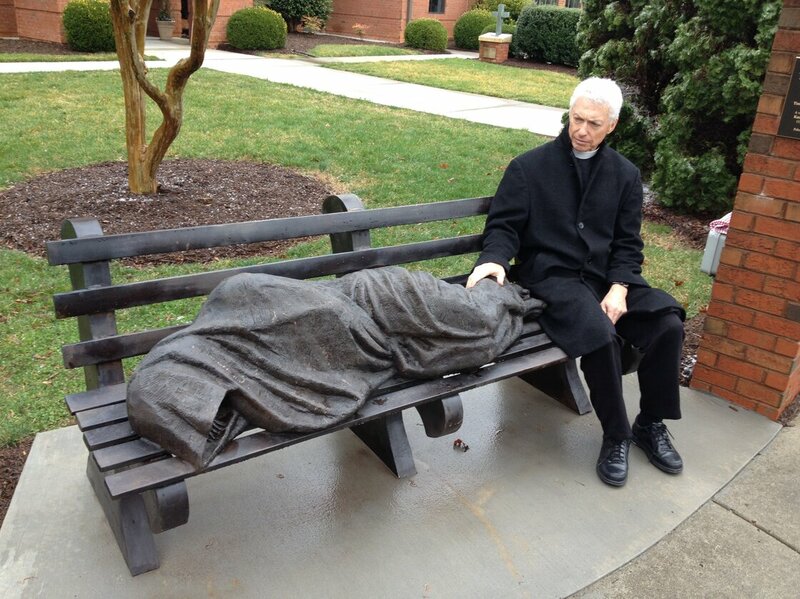 This lakeside college town north of Charlotte has the first Jesus the Homeless statue on display in the United States. Catholic Charities of Chicago plans to install its statue when the weather warms up. The Archdiocese of Washington, D.C., is said to be interested in one, too. The creator is a Canadian sculptor and devout Catholic named Timothy Schmalz. From his studio in Ontario, Schmalz says he understands that his Jesus the Homeless is provocative. He says he offered the first casts to St. Michael's Cathedral in Toronto and St. Patrick's Cathedral in New York. Both declined. A spokesman at St. Michael's says appreciation of the statue "was not unanimous," and the church was being restored so a new work of art was out of the question. That statue found a home in front of the Jesuit School of Theology at the University of Toronto. A spokesperson at St. Patrick's in New York says they liked the homeless Jesus, but their cathedral is also being renovated and they had to turn it down. The most high-profile installation of the bronze Jesus on a park bench will be on the Via della Conziliazione, the avenue leading to St. Peter's Basilica — if the City of Rome approves it. Schmalz traveled to the Vatican last November to present a miniature to the pope himself. Back at St. Alban's in Davidson, the rector reports that the Jesus the Homeless statue has earned more followers than detractors. It is now common, he says, to see people come, sit on the bench, rest their hand on the bronze feet and pray. how do you call the police on a homeless person that's sleeping? Calling the police on Jesus...she should be ashamed of herself. Yes because they could have used the money to help actual homeless people. even though they spent 22k on it, it's an investment because the statue might inspire people to give more than they normally do...not the people that hate it though.